There’s no doubt that dental implants come at a higher cost than other options in tooth replacement. Compared to a traditional denture or fixed bridge, dental implants in Massapequa can cost as much as thousands more. But you know what? They cost that much because they’re worth it. Your dentist uses high quality materials to ensure your tooth replacement looks great, feels comfortable, and functions well for a lifetime to come. While more and more billboards are advertising “cheap” dental implants, implant dentistry isn’t a place to look for a bargain. Successful dental implants are made out of high quality materials and are surgically placed beneath the gum line. You will need anesthesia to remove all feeling in the jaw during the procedure. Sometimes, preliminary procedures are needed to strengthen the jawbone and create a healthy environment for the dental implants. All of these steps combined add up to significant investment. A single dental implant may cost somewhere between $1,000 and $3,000. It’s a price most patients agree is worth its weight in gold — and then some. Missing teeth cause the jawbone to deteriorate over time, as the lost roots drain the bone tissue of the blood flow and nutrients it needs to thrive. By providing prosthetic roots for the new tooth replacement, dental implants stimulate the jawbone to keep it healthy and whole for a lifetime to come. That means you are more likely to keep your existing natural teeth intact, preventing the need for additional implants later on. Dental implants can also be expected to last for a lifetime. Non-implant retained dentures and bridges will need to be replaced periodically to keep up with the changing shape of the jawbone. Each new denture can cost as much as $1,000 at every replacement. So while dental implants do cost more upfront, patients usually find that over time, they are by far the best financial investment after the loss of one or more teeth. 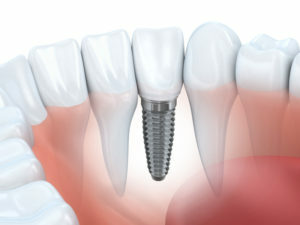 Healthy patients whose tooth loss is recent are often eligible candidates for dental implants. The only way to find out for sure is to visit your implant dentist. When you do, we will consider your health history and evaluate your jawbone to determine whether or not it is sturdy enough to support dental implants. If it isn’t, a preliminary procedure like bone grafting or sinus lift can help. Once we determine that dental implants are right for your smile, we can start putting together a treatment plan right away! Are you ready to invest in a high quality tooth replacement? Dental implants fit the bill. Please don’t wait to get in touch with South Shore Dental Care — schedule an appointment today! by: Dr. Stutman's Office at June 20, 2017 .